I love Homemade Chex Mix, not the kind you get in a bag from the grocery store, but the kind that you bake in the oven at home. 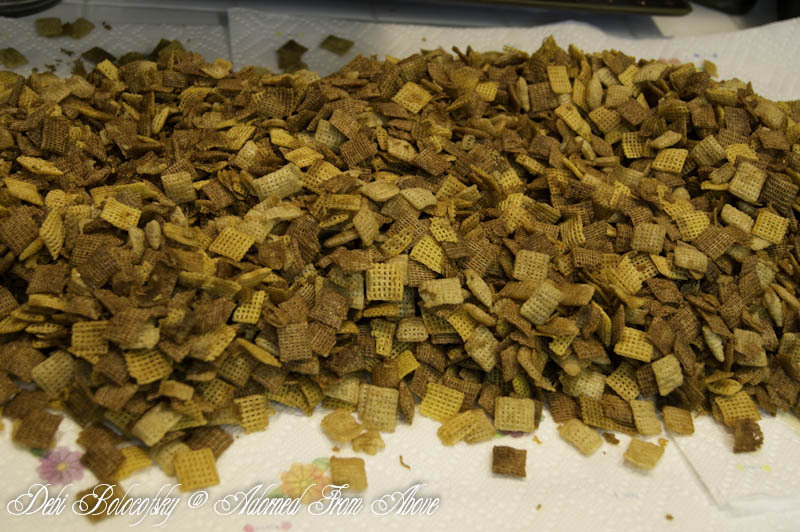 We made a batch of Homemade Chex Mix a few weeks ago. Middle child Danny is still trying catch up on his favorite snacks food from being in the marines. I took pictures, because I wanted to share this recipe with all of you. I don't really follow the recipe on the box, I changed it long ago. I decided that I wanted to give you some history on this great snack food. So I did some research for all of you. My Aunt Laura has been making this for as long as I can remember, I knew it was an old recipe. 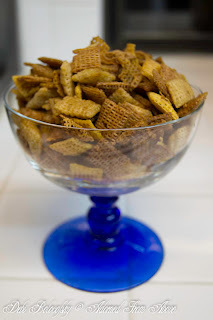 I found that the first recipe for Chex Mix was published in June 1952 issue of Life Magazine. 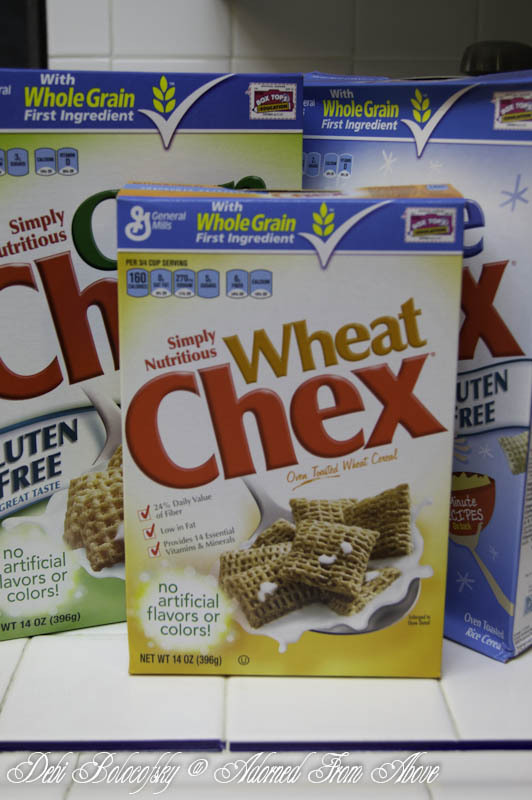 It is similar to what we have today, but in 1952 they only had Rice Chex and Wheat Chex. There were several incarnation of Chex Mix until they came out with the recipe for "Party Mix" in the December 1963 issue of Better Homes and Gardens. 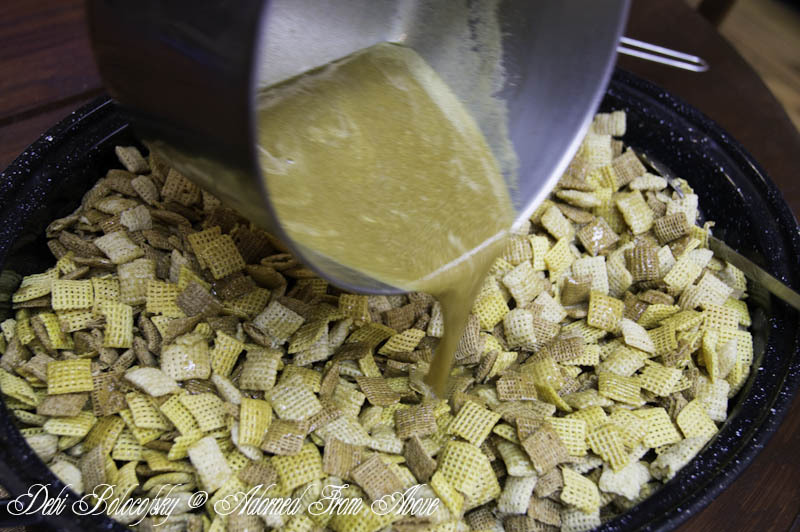 Here is the recipe that we use to make Homemade Chex Mix. In a sauce pan melt butter, and stir in Worcestershire sauce and seasoned salt. Mix cereals and any other ingredients that you might want in the mix in a large roasting pan. 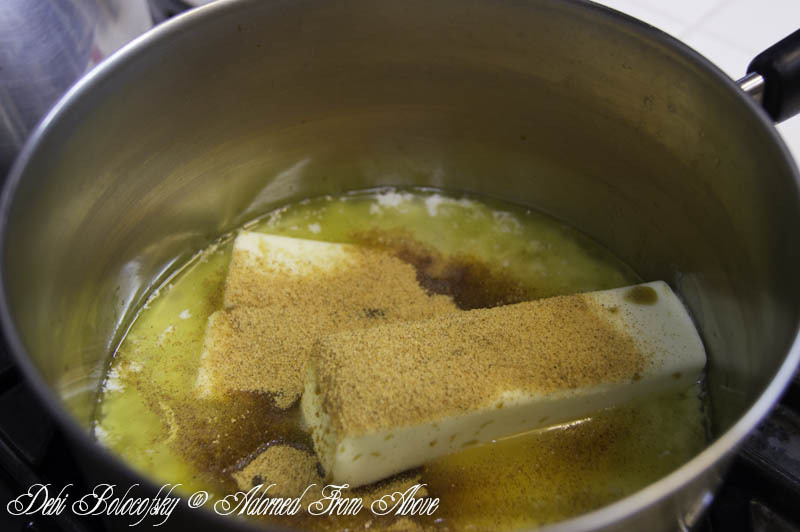 Then pour the 1/3 of the butter mixture over the cereal and mix the cereal to coat with butter. Add the next 1/3 of butter and mix cereal mixture again, do the same with the last 1/3 of the butter. Put in the oven and bake for 1 hour, stirring every 15 minutes. Put on paper towels to cool. Once cooled, put in tins or plastic containers to store. 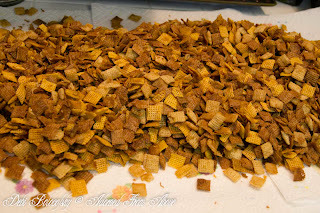 I hope that you like this Homemade Chex Mix Recipe. I use more butter and Worcestershire sauce then the regular recipe on the box, because I like it really coated with the butter mixture, rather then dry. Let me know what you think of this recipe. It would be great with yesterday's Cosmopolitan's. I am so happy that you came by. I want some now also, but I have no self control when it comes to this stuff. Never knew it was called this, but when we lived in Canada, I used to do something like this, but not using Worcestershire sauce. I added good old-fashioned salt and mixed in some garlic! Maybe a little anti-social, but boy did it taste good1 Might try a smaller version for myself sometime! Thanks for the reminder! The regular recipe calls for garlic, but we like it better without. My aunt makes it with garlic. Good tutorial. Hopping from G+ party. I'm so happy that you came over. Thanks for visiting. Love this stuff! Thanks so much for linking up at One Creative Weekend! Thanks for hosting and visiting. I'm so happy that you like the recipe. it is so good. Thanks for visiting. Thanks for linking this great post to the Say G'day Linky Party. 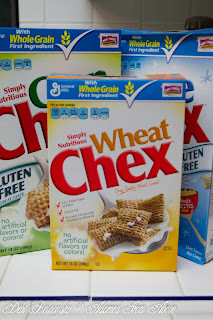 We don't have chex over here sadly but I might see if I can try it with something else. I'm pinning this and sharing it Google+! 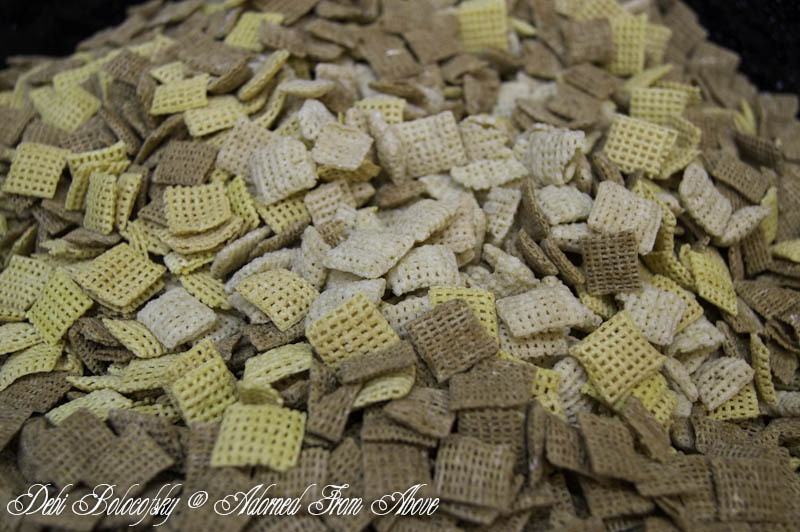 Chex cereal are small squares of either corn, wheat, and rice. They kind of have an open weave look. I hope that you can find something like it. It is so good. Thanks so much for hosting. Thanks so much for visiting. I love this also. I will be at your party.